For any community member who works with kids; such as babysitters, new parents, teachers and coaches. This course is for anyone with limited or no medical training who needs a course completion card in First Aid, CPR and AED use to meet job, regulatory or other requirements. Camp counselors, child care workers, coaches, foster care workers, Others responsible for children including parents, grandparents, babysitters and guardians, teachers, youth group leaders. The HeartSaver Pediatric First Aid CPR AED Course is designed to meet the regulatory requirements for child care workers in all 50 United States. It teaches child care providers and others to respond to and manage illnesses and injuries in a child or infant in the first few minutes until professional help arrives. The course covers the Four Steps of Pediatric First Aid and modules in: Pediatric First Aid, Child/Infant CPR AED, Adult CPR AED (optional), Asthma Care Training (optional). HeartSaver Pediatric First Aid CPR AED Online Part 1 teaches child care providers and others to respond to and manage illnesses and injuries in a child or infant in the first few minutes until professional help arrives. Part 1 online: can be completed in approximately 2 ½ hours. 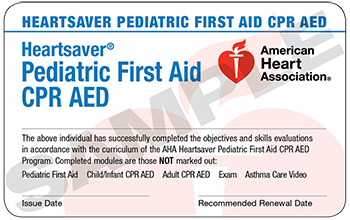 The American Heart Association HeartSaver Child First Aid, CPR, & AED course completion card is valid for two years.